Every business depends on satisfied customers. We are no different. However, we are not content to have satisfied customers, we want our customers to be delighted with our work as well. We are not successful at that 100% of the time, but that is what we strive for. We would like you to know the two foundational principles we use to structure our business to bring delight to our customers. First, customers need to feel comfortable with us. They need to know that we are competent to do the work they need to have done. 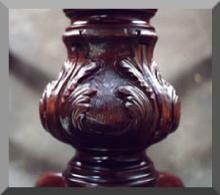 They need to be assured that we will treat their valued pieces with the same care they would. They need to know that we welcome their business and will treat them honestly and fairly. Our intention is to satisfy each of those concerns. We hope that the information provided in this web site will go a long way toward answering questions of competence, care and integrity. When you are ready, contact us directly, we look forward to demonstrating in person what we have shown in these pages. Second, details are important. More than anything else, the degree of attention we pay to details will determine the degree of success we will have at returning to our customers pieces of furniture they will delight in. Rather than attempting to describe the attention we pay to detail, in this gallery, we would like to show you. The pages accessed by the links above offer a large variety of illustrations of work not shown elsewhere on this website. We hope you enjoy and are inspired by the display. We also hope that when you are ready to have work done on your pieces, you will contact us. 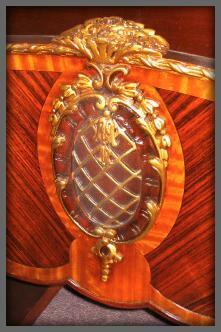 When this footboard came in the gilding was barely discernable and the strong grain pattern was greatly muted. Careful cleaning, touch up and rejuvenation yielded a stunning result.